While Sweet Smell of Success (1957) was a hit with film critics at the time, it was not a box office smash as fans of the film’s two leads – Burt Lancaster and Tony Curtis – were put off seeing their matinee idols portraying unlikable characters. Based on Ernest Lehman’s novelette and adapted by Clifford Odets, Alexander Mackendrick’s film is a cynical love letter to New York City – seen as a dog-eat-dog town with a richly textured film noir look courtesy of legendary cinematographer James Wong Howe. Sweet Smell’s reputation has only grown over time and is now generally regarded as one of the best-written films with quotable dialogue and also one of the finest takes on tabloid journalism. Sidney Falco (Curtis) is an unscrupulous press agent, a bottom feeder who does anything he can to get his clients mentioned in mainstream publications like The New York Globe. For some time, he’s been trying to get in the good graces of J.J. Hunsecker (Lancaster), the most influential newspaper columnist in the city. He’s even willing to break up the romance between Hunsecker’s kid sister Susan (Harrison) and Steve Dallas (Milner), an up and coming jazz musician, by planting a story that her boyfriend dabbles in drugs. Falco sees Hunsecker as “the golden ladder to the places I want to get,” which is a position where he’s the one calling the shots instead of spending all of his time hustling. Odets’ much celebrated hard-boiled dialogue crackles with energy and intensity as evident in the scene that introduces Hunsecker. “You’re dead son. Get yourself buried,” is how he casually dismisses Falco. “Match me, Sidney,” is another witty remark courtesy of Hunsecker. Falco gets his own clever remarks as he tells Hunsecker at one point, “Cat’s in the bag and the bag’s in the river.” In a film like Sweet Smell of Success, words are weapons which men like Falco and Hunsecker use to destroy people with no remorse. The film was quite a risky venture for both Tony Curtis and Burt Lancaster at the time. They were popular box office draws and their roles in Sweet Smell of Success were very different from what their fans were used to seeing. Curtis, in particular, wanted to shed his pretty boy reputation by taking on more substantial material while Lancaster was a maverick within the industry and formed his own production company in order to generate personal pet projects like Sweet Smell. Right from the opening shot, Mackendrick presents New York as a busy, claustrophobic and noisy place drenched in noirish shadows. It’s a place where heartless individuals like Falco and Hunsecker prey upon the weak. While the latter was based on infamous gossip columnist Walter Winchell, he is also a predecessor to muckraking gossip hounds of today, including websites like TMZ and feared industry insiders like Nikki Finke. 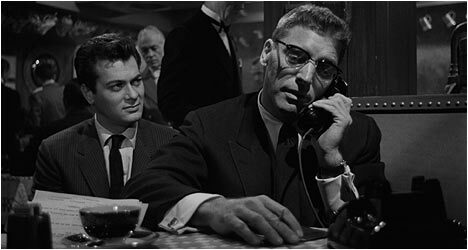 Sweet Smell of Success, with its snappy acerbic dialogue, anticipates the stylized tough guy banter of David Mamet and the fast-talking characters in Aaron Sorkin’s television shows. It was one of the rare, uncompromising films from the 1950s that dared to be critical of the establishment and still get made and released within the system. The folks at the Criterion Collection have given this cinematic classic the deluxe treatment it so richly deserves. Time to throw away the bare bones MGM DVD that was released years ago as this new edition features a pristine transfer that restores the Sweet Smell of Success’ exquisite black and white cinematography, and includes several wonderful extras. The first disc features an audio commentary by film scholar James Naremore who wrote the BFI Film Classics book on Sweet Smell of Success. He offers excellent analysis of various aspects of the film and also provides biographical detail on the principal cast and crew. In addition, Naremore provides important details on Walter Winchell, the inspiration for the character of J.J. Hunsecker. He also takes us through the genesis of the film in this engaging and very informative track. The second disc starts off with “Mackendrick: The Man Who Walked Away,” a 1986 documentary about director Alexander Mackendrick that runs 44 minutes in length. Contemporaries, like Burt Lancaster, and fellow filmmakers, like John Milius, speak highly of the man. Mackendrick himself talks about his beginnings in advertising thanks to his aptitude as an illustrator – a skill he applied to his filmmaking. This doc sheds light on this often-forgotten film director. “James Wong Howe: Cinematographer” is a 1973 documentary that features the Academy Award-winning director of photography giving a tutorial on film lighting. In addition, he also tells some entertaining filming anecdotes from his illustrious career and shares his approach to cinematography. “Gabler on Winchell” takes a look at the columnist that inspired Hunsecker in the film. We learn of Walter Winchell’s importance to American journalism, including the notion of celebrity and the concept of personal style in reporting. He grew to great prominence in the 1930s and wielded a lot of power with the ability to make or break people’s careers. Finally, there is a 25-minute interview with director James Mangold (Cop Land, Walk the Line) who was one of Mackendrick’s students. Mangold recalls his initial impressions of Mackendrick and what drew him to the man. He says that in his teachings, Mackendrick stressed the ability to tell a story, an understanding of acting, and how a scene worked. Mangold speaks with obvious affection for his mentor in this engaging extra.